You are currently browsing the daily archive for April 25, 2008. Perspective makes all the difference. It’s an essential consideration in fotos. It shapes perception and determines how we see color. Imagine the Empire State Building as seen from the sidewalk–corner of 34th and 7th Avenue v. seeing it on your computer screen via Mapquest satellite. 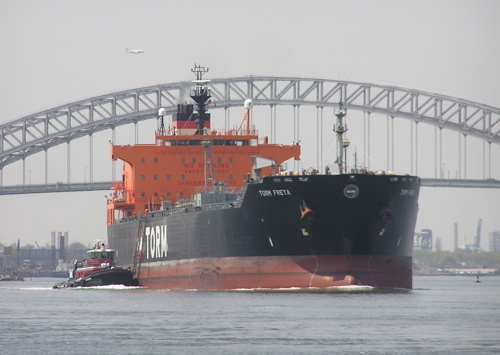 See Kennebec Captain’s insightful post on ships at this link. 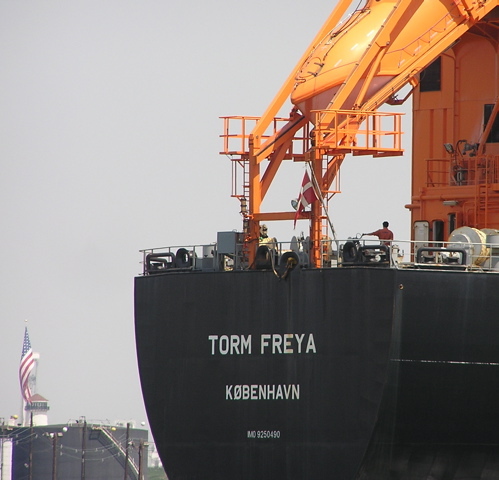 Above, Laura K. Moran guides Torm Freya through the winding Kills on its way outbound yesterday. Freya‘s colors are even more striking in this Flickr shot. Below, see the crewman in orange standing behind the bulwarks at the base of the mast? 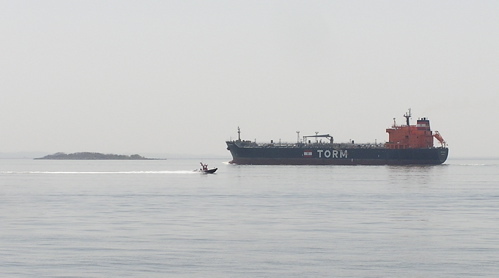 By happenstance, notice land and air traffic–made possible by waterborne fuel. as Freya heads southeast toward the Ambrose Channel. 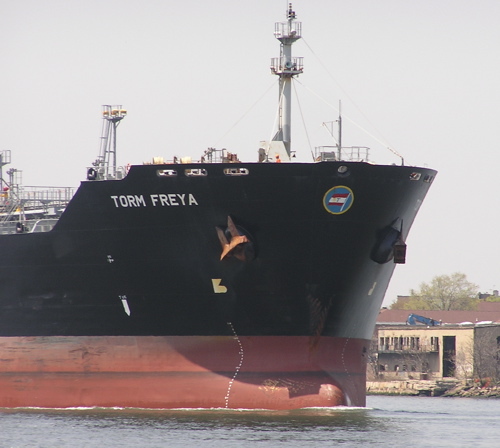 See this link for a shot of Freya squeezing through the Panama Canal. Freya and her sisters have great evocative names–Gerd, Thyra, Vita . . . –names that conjure up visions made real by Dave’s blog, NeverSeaLand. Oh, I’m not calling these “ship of the day” because an entire blog already carries that name here.